Funrise is an adventurous innovator of superior toys and an industry leader in the manufacturing and distribution of the most popular children's toys. Simply put…we create fun! The NEWLY REDESIGNED Bubble Typhoon is the ultimate bubble fountain, blowing 5,000 bubbles per minute! Simply switch it on and watch in amazement as a Typhoon of colorful bubbles shoot upwards creating bubble blizzard. The Typhoon comes with 32 oz. of The one and only, Gazillion Bubble solution. Great for parties! (Requires 8 AA Batteries Not Included). 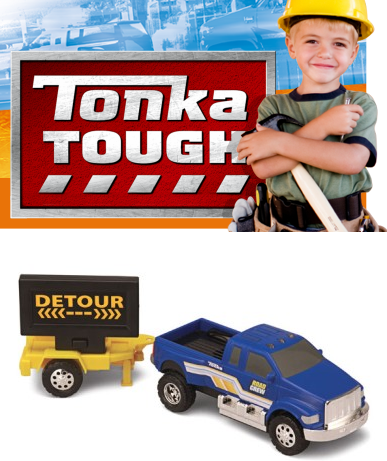 Help others obey the rules of the road with your Road Crew Truck and “Detour Sign”! With a new hyper glow LED flashing light sign, keeping the streets safe will never be a problem again! Bubbles are one of my absolute favorite pastimes from childhood! After recently seeing The Gazillion Bubble Show at the New World Stages in New York, our kid's are now completely mesmerized with the science and art of Bubble making. They have spent countless hours trying to recreate the scenes from the Gazillion Bubble Show, and now they can with the Gazillion Bubble Typhoon! Dispersing hundreds of bubbles every minute, the Gazillion Bubble Typhoon disperses a blizzard of bubbles just as they do in the show! Kid's and adults alike) LOVE IT! 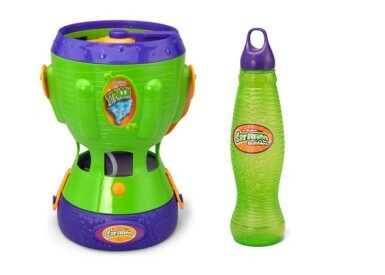 Simply fill the tank in the base, and push the button for hours of bubble fun the entire family can enjoy! The kid's have also been enjoying racing the Tonka Road Crew Truck through the sandbox in the backyard. With the realistic blinking detour sign I'm positive it will continue to foster creative play for a long time to come! Entry to this giveaway ends on August 11, 2011.Winner's are chosen randomly through random.org.The winner will be announced within 7 days of the giveaway ending and contacted through email. The winner will have 48 hrs. to respond or another winner will be chosen. I don't have any kids of my own, but I'm a kid at heart. :) I like the Tonka Strong Arm Bulldozer. Thanks!! I'd love to add the Tonka Strong Arm Bulldozer to our summer fun too and I am a public follower via GFC. 1 I Like Funrise on FACEBOOK. 2 I Like Funrise on FACEBOOK. 3 I Like Funrise on FACEBOOK. 4 I Like Funrise on FACEBOOK. 5 I Like Funrise on FACEBOOK. 6 I Like Funrise on FACEBOOK. 7 I Like Funrise on FACEBOOK. 8 I Like Funrise on FACEBOOK. 9 I Like Funrise on FACEBOOK. 10 I Like Funrise on FACEBOOK. 1 I follow Funrise on TWITTER. 2 I follow Funrise on TWITTER. 3 I follow Funrise on TWITTER. 4 I follow Funrise on TWITTER. 6 I follow Funrise on TWITTER. 5 I follow Funrise on TWITTER. 7 I follow Funrise on TWITTER. 8 I follow Funrise on TWITTER. 9 I follow Funrise on TWITTER. 10 I follow Funrise on TWITTER. 1 I entered your MyCoupons.Com Giveaway. 2 I entered your MyCoupons.Com Giveaway. 3 I entered your MyCoupons.Com Giveaway. 4 I entered your MyCoupons.Com Giveaway. 5 I entered your MyCoupons.Com Giveaway. 1 I entered your Schwinn Legacy Cruiser Giveaway. 2 I entered your Schwinn Legacy Cruiser Giveaway. 3 I entered your Schwinn Legacy Cruiser Giveaway. 4 I entered your Schwinn Legacy Cruiser Giveaway. 5 I entered your Schwinn Legacy Cruiser Giveaway. 1 I entered your HANNspree Apple HDTV Giveaway. 2 I entered your HANNspree Apple HDTV Giveaway. 3 I entered your HANNspree Apple HDTV Giveaway.